62889 PER5515.jpg 500X638\PER5515.jpg 62890 PER5515_1.jpg 500X638\PER5515_1.jpg 62891 PER5515_2.jpg 500X638\PER5515_2.jpg Send A Hint! Place your order for this adorable teddy in love drawstring bag! The gift is available for next-day delivery, countrywide. The drawstring bag reads, 'I love you, Hannah. More than you know, William'. Personalise the bag and the t-shirt on the teddy by uploading the relevant names. Use this gift to show your loved one just how much they mean to you! 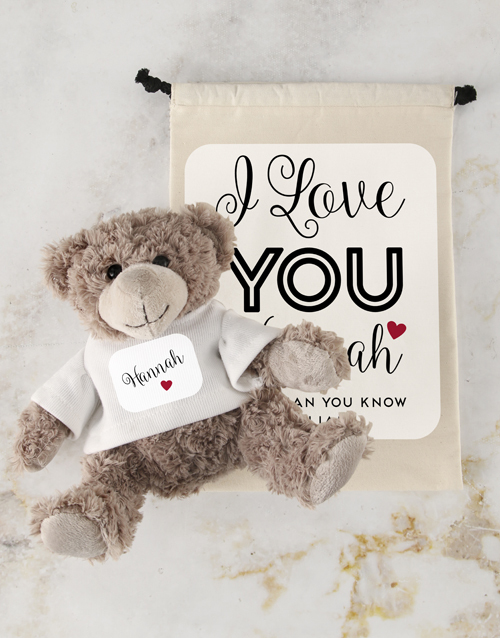 Get this Teddy In Love Drawstring Bag delivered with NetFlorist.